Pilgrim Firs camp and conference center was a fantastic venue,beautiful setting, good food and kayaking and lots of coffee. On the first day I was overwhelmed by the size of the event, 80 people carving under gazebos in the sun! I set about carving a block of California Marble given to me by Carl. 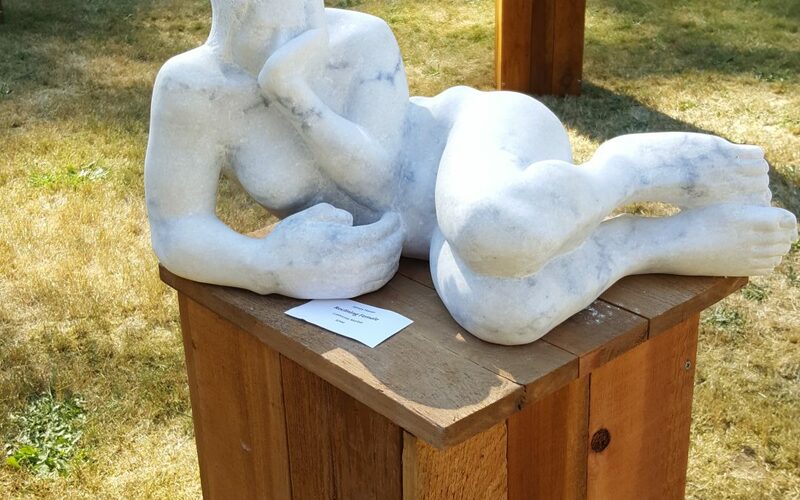 I decided to carve a reclining female figure, focusing on composition and negative space brought about through the process of direct carving. All around me people were carving Alabaster,Basalt, Dunite, Granite, Jade, and Soapstone. Clouds of dust rose for the first few days as sculptures took shape. It was a fascinating site to see such variety of sculptures appear from the dust. As the week went on I learned as mush as I taught and developed and interest in Jade (by all accounts and addiction, to be continued). People would come and go, chatting briefly or asking advice. All good natured, all engulfed in stone carving. I was lucky enough to be introduced to Karla Matzke, of Matzke Fine Art. Karla has taken two of my pieces into her gallery and I look forward to working with her over the coming years.